How Much International Diversification is Necessary? Does it make sense to equal weight the Europe and Pacific ETFs as opposed to just buying the entire EAFE index fund? How has this strategy done historically? This is a great question because so many U.S. investors have a home bias within their portfolio and probably don’t spend enough time thinking about their foreign stock market allocation. The MSCI EAFE index is generally used as a broad benchmark of the developed foreign stock markets. EAFE stands for Europe, Australia and the Far East. But you can also break out this index by the two largest regions — the MSCI Pacific Index which includes mainly Japan, Singapore, Hong Kong, Australia and New Zealand or the MSCI Europe index which includes places like the UK, Germany, France, Spain, Italy, Sweden and Switzerland. The 50/50 allocation showed better overall performance for the entire period and outperformed the EAFE in every decade but one. Volatility was actually lower in the 50/50 allocation as well, but it was a minor difference (22.3% vs. 21.9%). 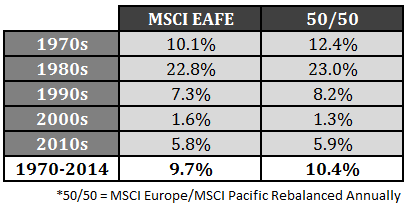 One of the biggest reasons that the 50/50 split outperforms the MSCI EAFE is because of the rebalancing bonus. The interesting takeaway from these numbers is that if you were to take a simple equal-weighted portfolio of all three markets with an annual rebalance, the return jumps to 10.6% — higher than any of the three individual markets on their own. How is this possible you might ask? Breaking this down even further, 60% of all annual periods saw all three markets rise at the same time. But all three were only down in the same year 16% of the time. Two markets were down with one in positive territory 11% of the time while two out of the three showed annual gains 13% of the time. So it does appear that historically there have been benefits to diversifying the international portion of your portfolio more broadly by breaking things up. But there is a catch here. This strategy requires discipline. An investor would have been selling Pacific-based stocks during the 70s and 80s to buy U.S. and European shares which were relatively underperforming. During the 90s that trend reversed and you would have been buying more Pacific stocks and selling U.S. shares when rebalancing. The past few years investors would have been selling the U.S. markets and buying abroad. It’s not easy for investors to force themselves to adhere to a strict rebalancing plan which is required when implementing a broadly diversified portfolio. It comes down to how many funds you can stand within a portfolio from the perspective of monitoring and ongoing maintenance. For certain investors it’s just easier to keep things simple by investing in a single international fund. As always, it depends on the investor’s tolerance for complexity and ability to implement a long-term strategy. It doesn’t really matter how you allocate your portfolio within the different asset classes if you don’t have a process in place that allows you to efficiently extract as much performance as you possibly can from each. It’s heresy … but given the increasing correlation among global equity markets in recent decades, and the similarity of their returns, international diversification is less compelling that it used to be. In particular, foreign exchange rate fluctuations add an extra dimension of risk and volatility to international holdings. This effect has been on display with a vengeance since mid-2014, as the USD first roared ahead (crushing returns on international funds), then (since mid-March) got smacked back down. One can hedge out the forex exposure, but return expectations will suffer owing to hedging cost. Do we really need this currency aggravation? It does not sit well with me. That’s valid but I still think int’l stocks have a place in a diversified portfolio even if the market are much more correlated these days. My unscientific theory is that investors will always have over- and under-reactions to the different regions because of economic news, geopolitical fears, etc. And even if these markets do have similar returns going forward, you might as well take part in all that they have to offer as a risk diverisifier. How about emerging markets? Do you take into account the maturity of an economy when thinking about this? I’m not sure I agree with that. During financial stress, the correlation of equity markets does rise, but in normal times correlations fall, so that over the long term there is a significant diversification benefit to had. And the currency changes play an important part in that diversification. This article is a good review, also. A very interesting perspective – especially for those who think diversification means “domestic and international”. Makes me think twice about investing developed ex-NA only in an EAFE ETF! Maybe…I really think it comes down to what you’re comfortable with. You could break this down even further by including small cap int’l stocks, int’l value, emerging markets and the list could go on. Some people will find the ease of a total int’l fund suits them better than breaking things up into smaller fund allocations. Just depends how much you want to tinker around with different funds. Great article. You are correct about “it requires discipline”. The problem with breaking broad areas into more specific smaller areas is that the very important KISS principle goes by the wayside. In my opinion it is better to not get too involved with rebalancing too many things unless you are really willing to spend time and are emotionally intelligent about doing it. Most folks are not. Agreed. I think someone really has to care enough to pay attention and learn about the different sub-asset classes to make this approach work. For everyone else, the KISS approach works just fine. Interesting article, but I think it is incomplete since it does not include the variability (beta) for each period of each index. When you discuss indexes, I strongly suggest that you include variability with your return numbers, since it is variability rather than overall performance that typically results in investors panicking and damaging their portfolio’s results. I actually did include the standard deviation which measures the variability of returns. 22.3% for the EAFE and 21.9% for the 50/50 split. Yes, but you did not for comparing Europe, the Pacific, and the United States, where the differences would be larger and have greater implications for investors. Much higher vol in Pacific stocks (30%) mainly because the returns were so high in the 70s & 80s. Europe was around 22% while US stocks were closer to 18%. No worries. I appreciate the back and forth. I get a ton of good ideas from readers on how to look at things differently and I’m always open to suggestions. Thanks for the feedback. That’s interesting that his blog linked to one of my posts. You happen to remember which one? Just curious. It was a couple of years ago, so I no longer remember which one discussed one of your articles. Ben – Great work, as always. I’ve been researching this topic quite a bit lately as well. Given that the current bull market has been dominated by U.S. stocks, I think the behavioral challenge is probably even more broad than MSCI Europe/Pacific vs MSCI EAFE. Simply put, it’s the significant underperformance of foreign developed market stocks compared to U.S. equities. 1988 to 2014 MSCI EAFE has returned just 5.72% compared to 10.62% for the S&P 500. That’s a tough pill to swallow and makes it challenging for investors to stick to their plan. Agreed. I didn’t include anything on the emerging markets where I personally think investors are going to want to have some exposure over the next few decades as those countries mature. From what I can tell the EAFE also rebalances – in may & november of each year. i bring this up because you talk about the rebalancing bonus between etfs and was curious what you thought about the rebalance within the EAFE index…thanks. Good question. The EAFE is rebalanced semi-annually, but it’s rebalanced with new stocks, not by geography. So the EAFE allows the different regions to grow or shrink and doesn’t rebalanced back to a pre-determined weight by country. That’s probably why it underperforms.